The Adam-God Theory suggests that Adam, who "fell that man might be," may be the same being as God the Father, the father of our spirits and the physical father of Jesus Christ. This idea has been misconstrued from comments, never fully explained, by President Brigham Young, the second prophet and President of The Church of Jesus Christ of Latter-day Saints. It is useful to note that "Adam" is a title, which means "first man." God explained to Moses, "And the first man of all men have I called Adam, which is many" (Moses 1:34). God the Father is also a Man, for "in the language of Adam, Man of Holiness is his name, and the name of his Only Begotten is the Son of Man" (Moses 6:57). Since God the Father is the progenitor of Adam and Eve (as He is, indeed, the father of us all), the title of "first man" or "Adam" might equally apply to Him. This is one possible explanation of President Young's comments on the matter. 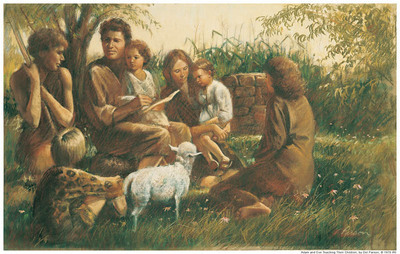 Another common theory among Latter-day Saints is to accept that Brigham Young taught that Adam was our father and our God and the father of Jesus Christ, but to assume that he was wrong and that further revelation has clarified this subject . It is useful to note that early church leaders often felt free to publicly expound upon personal opinions and theories. Church leaders and members have gradually become more careful about remaining within the bounds of established doctrine. Familiarity with this newer approach has caused some modern readers to inappropriately assume that the statements of the earlier Brethren carried more weight and certainty than they actually did. The doctrine was never submitted to the councils of the Priesthood nor to the church for approval or ratification, and was never formally or otherwise accepted by the church. It is therefore in no sense binding upon the Church. Brigham Young's "bare mention" was "without indubitable evidence and authority being given of its truth." Only the scripture, the "accepted word of God," is the Church's standard. We hope that you who teach in the various organizations, whether on the campuses or in our chapels, will always teach the orthodox truth. We warn you against the dissemination of doctrines which are not according to the scriptures and which are alleged to have been taught by some of the General Authorities of past generations. Such, for instance, is the Adam-God theory. We denounce that theory and hope that everyone will be cautioned against this and other kinds of false doctrine. This page was last edited on 26 August 2010, at 12:06.